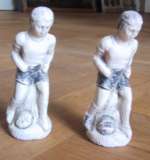 This pair of France garden sculptures of two boys on a pedestal are made in France with a"windblown" outdoor rough structure to the bisque-as if they have been outdoor for a century in the garden. What you ay call a kind of "shappy chick".They have minor difference in the color to the painting of hair and trousers .Size H. 3 3/4". Size of the base 1 1/4" across. France ca 1880. Marked SF. (for SOICIETE FRANCE) The price is for the pair. For the dollhouse garden or sunroom. Lovely peacock for the dollhouse garden or solarium.This highly decorative bird is made in Germany by Elastolin. Marked. The material is composition. Great condition all over. 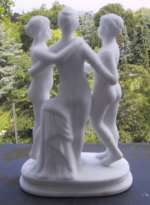 H.7 cm/3"
Sculpture of the 3 Grazes, who followed Venus- ( sign for beauty, graze and youth)only a made by Royal Copenhagen factory as a copy of the original large sculptue made by the famous sculptuerer Bertild Thorvaldsen, Size: 4 1/4 " high.It would properly be lovely for a dollhouse gardenor in a sun room.Also on a pedestal it would look nice.. 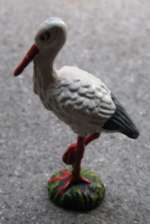 This s a lovely stork for your dollhouse garden as decoration or for the chimney! made in Germany by Elastolin. Lovely colors. Great condition all over. H. 7 cm /3"
Lovely Swan for the dollhouse garden or solarium.This highly decorative bird is made in Germany by Elastolin. Marked. The material is composition. Great condition all over. H.4 cm/1 2/4" L. 8 cm / 3 1/4""
A pair of French Sculpture of dogs made of a kind of rough bisque, that is more "windblown" in the bisque material. They are made in France about 1880-90.. Marked SF. ( for SOICIETE FRANCE). H of the dog sculpture is 3 3/4". The base is 1/4" x 1 1/2". It is really nice and also the "windblown" structure of the bisque as they have been outdoor for a century- looks good as an outdoor piece for your garden or sunroom. very decorative. Remark: These figures are more flat ( they are surely 3-dimensional-but they are made for sculpturing, not like a pet). They are lovely.All original no repairs. The price is for the pair.